Never did I imagine that backpacking in Turkey would be so much fun! From balloon-filled skies in Cappadocia, sailing along the Turquoise coast and playing numerous games of Tavla (backgammon) with the welcoming Turkish people, Turkey exceeded all my expectations. I solo backpacked in Turkey for almost 6 weeks, traversing the country from west to east. Here’s my ultimate guide to backpacking Turkey! Why should you go backpacking Turkey? Bonus: Fourteen Turkey experiences you don’t want to miss! Be amazed by the absurd landscapes of Capadoccia from your hot air balloon, bathe in the blue waters of Pamukkale and relax on the beautiful Turkish beaches. Many places in Turkey are still relatively ‘undiscovered’ by the tourist crowds. Enjoy a Turkish breakfast (the best breakfast in the world?) on a daily basis. I originally planned to backpack Turkey for about 3-4 weeks, but ended up staying almost 6 weeks, just because I loved it so much! 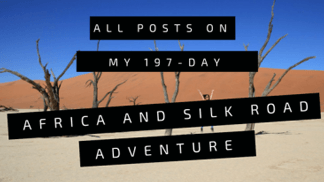 Backpacking Turkey was part of my Silk Road adventure. A 6-week travel Turkey itinerary by Bunch of Backpackers. Taking you from east to west. Highlights: White calcium carbonate terraces and paragliding! 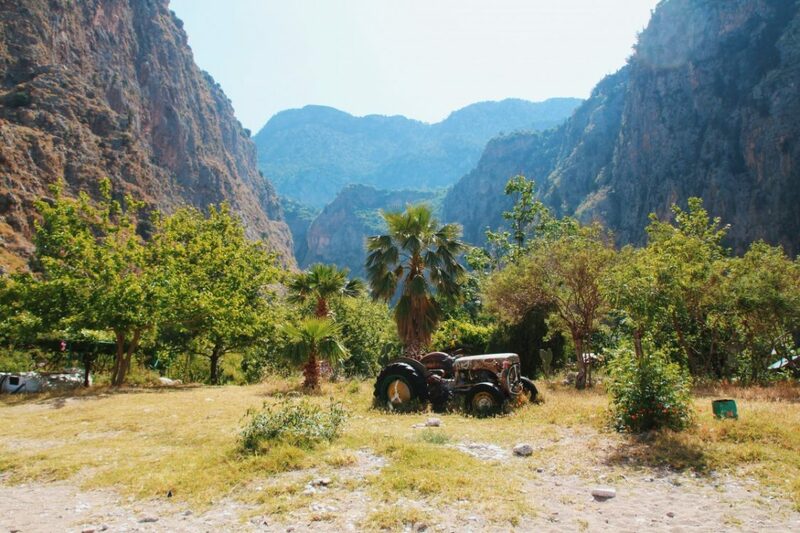 Highlights: Hiking parts of the famous hiking route ‘the Lycian Way’. 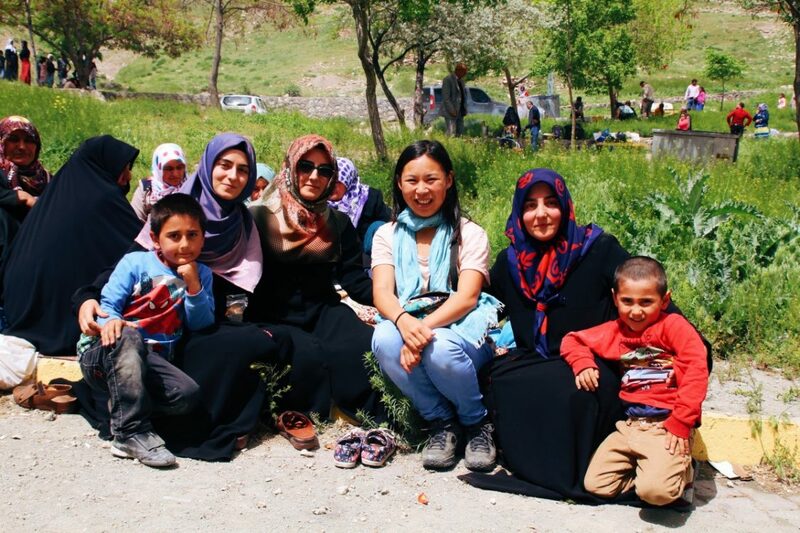 You will probably meet (Turkish) hikers along the way. Hiking to and camping at the Butterfly Valley (a secluded piece of beach that can only be reached by boat or by a very difficult hiking route). Chilling and relaxing along the coast. Amazing beaches in Turkey’s turquoise coast. Backpacking Turkey. Highlights: Backpackers mecca. Staying in a treehouse, evening bon fires, beach walks, rock climbing, sailing and snorkeling and ‘clubbing’. Friendly dogs. Highlights: Balloon flight at sunrise. Champagne. Hiking. Green Tour with Derinkuyu Underground City, Ihlara Valley hike, Selime Monastery, Pigeon Valley, Göreme Panorama. Urgup Saturday market. Stay in a cave house. Goreme and Cappadocia. Backpacking Turkey. Highlights: Lots of embassy visits for the visa game in Iran and Central Asia. Ulus area. Visit Ankara castle. Museum of Ancient Civilizations. Couch surfing meet-ups. City life. Kocateppe Camii. Ataturk mausoleum. If you ‘only’ have three weeks in Turkey I would suggest the following three-week Turkey travel itinerary. 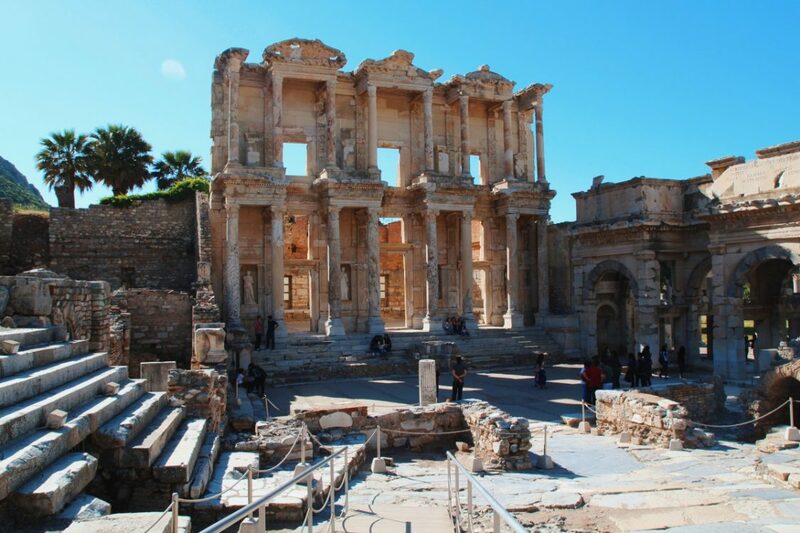 Start off with a few days in Istanbul, then take a flight to Izmir and Selchuk to visit Ephesus and Artemis. 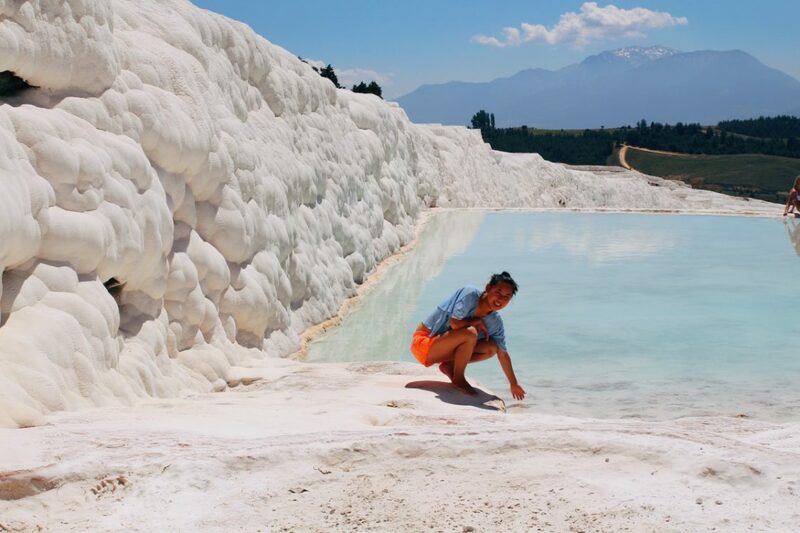 From there, board a bus to Pamukkale to witness the white terraces. 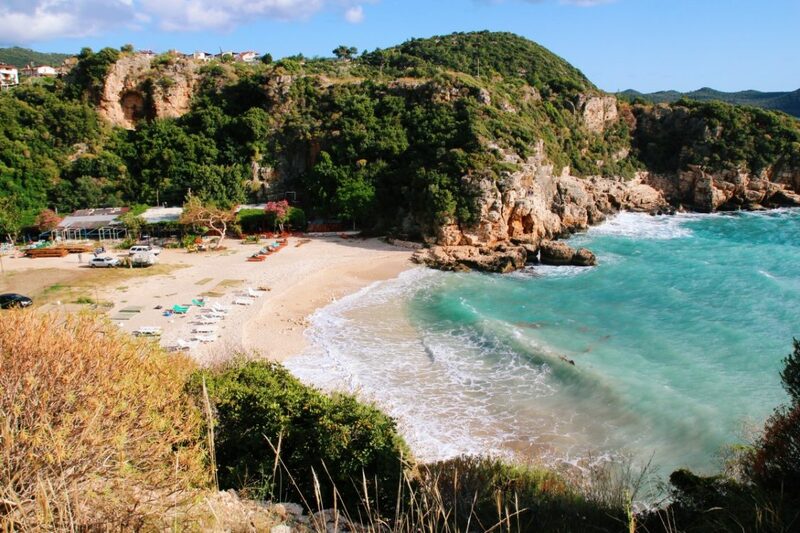 After that, head to the coast and visit Fethiye and a bit more off-the-beaten-track Faralya and Kabak. You can hike parts of the Lycian way (famous hiking trail) in this region. 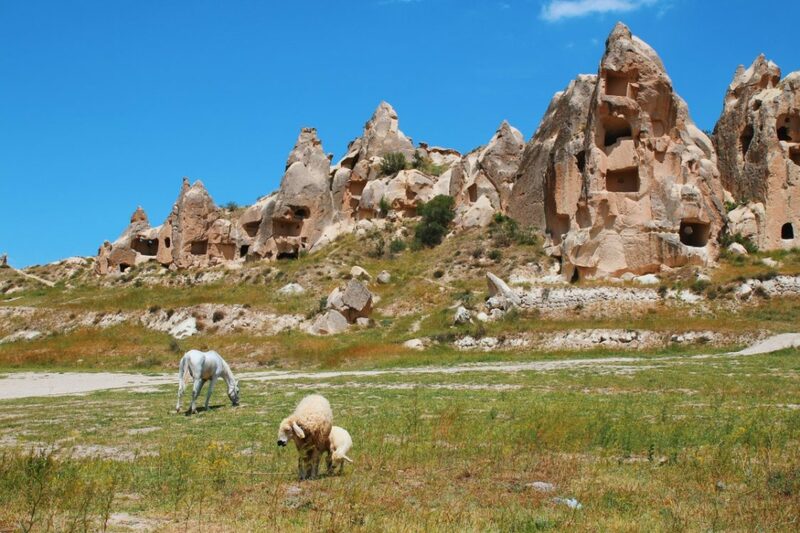 Head to Olympos and finish your trip with a hot air balloon ride in Capadoccia. Hiking parts of the Lycian Way was one my favorite things to do in Turkey! 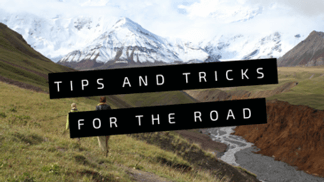 How to prepare for your backpacking trip to Turkey? Backpacking in Turkey is easy and safe, but you may want to pack and check some things before you go. Modest clothing. The large majority of people in Turkey is Muslim. Bring a head scarf! Learn some Turkish. Obviously, you will learn some Turkish on the road, but you may consider learning some basics while you’re still at home. It’s easy and useful! Check the latest Turkish travel advice from your government. (Personally, in most cases I won’t let this affect my travels). At the moment of writing (2018), the border area’s in the south are marked as unsafe. Download a VPN. I don’t remember Turkey had any restrictions, but a VPN is always useful to have on your phone. Download the maps.me application. The Turkey map has useful information. You may want to get travel insurance and some immunizations (check with your local tropical healthcare clinic). 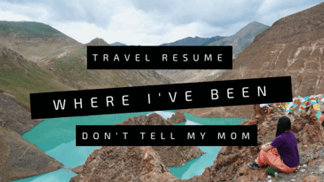 Please find my full packing list for long backpacking trips here. The best time to travel to Turkey is in spring (March-June) or autumn (Sept-Okt). I visited Turkey in April. I enjoyed perfect Turkish spring weather: warm and dry. This time is also perfect for hiking in Turkey. Turkey is huge, but fortunately it is very easy to get around by public transportation. You can use trains, big buses and dolmus. Most places in Turkey have a bus station, called the otogar, garaj or terminal. Here you can find all buses. Big intercity buses are very comfortable, reliable and fast. You often get drinks and food (lemoncake!). Trains are also very comfortable and cheap! Dolmuses sometimes stop often, but are also easy and cheap to get around. You will need a dolmus for all short-distance travel. Dolmuses are a great way to meet Turkish people. Domestic flight are also a good option considering the size of the country. Flights are affordable. I only took one domestic flight from Istanbul to Izmir, which cost approximately 35 euro. Like always, I kept track of my expenses on paper. In Turkey, I spent roughly 30 euro or 35 USD’s per day. This included relatively expensive activities such as paragliding above Pamukkale and ballooning in Cappadocia. I mostly slept in dormitories in hostels or in my tent and ate at small local places, which kept my Turkey backpacking costs low. 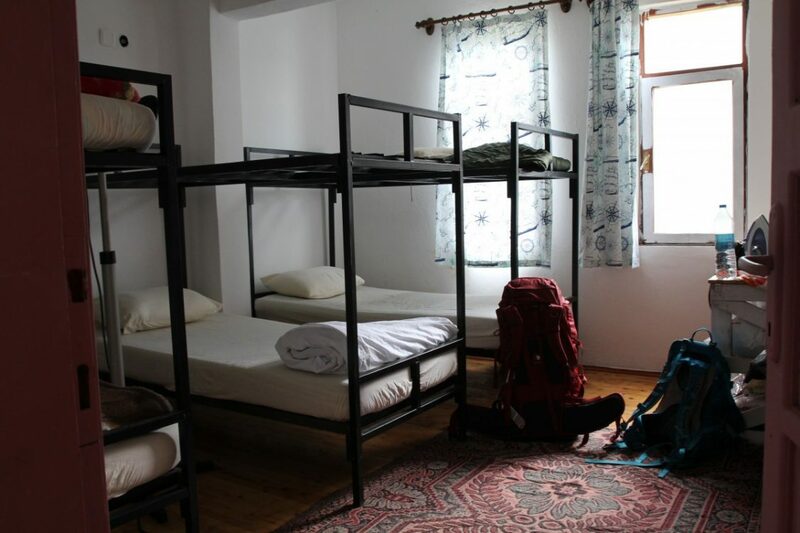 Most dormitories are about 8-9 euro per night. A single budget room is about 18 euro per night. These prices often include breakfast. Food is between 2-4 euro per meal. A large heap of your Turkey backpacking budget will go to entrance fees. The entrance fee for Ephesus library and Aya Sophia is for example 10 euro. Due to frequent terrorist attacks throughout the country, tourism in Turkey has been low. When I was in Turkey in 2016, most places were quiet and empty. Sometimes I was the only backpacker around. However, these days (2019), Turkey is marked (largely) safe by the UK Department of Foreign Affairs, and fortunately more tourists visit Turkey again! In my opinion, traveling in Turkey is safe. Just avoid the south and the border area with Syria and Iraq. As a ‘solo female traveler in Turkey, I haven’t really felt unsafe while backpacking in Turkey. I had one incident in a hotel in Eastern Turkey (Kars) with a hotel receptionist, who came to my room in the evening to ask for a kiss. I blocked my hotel door and called a friend. This was the only case of sexual harassment I encountered. I did a few hikes alone in Turkey. 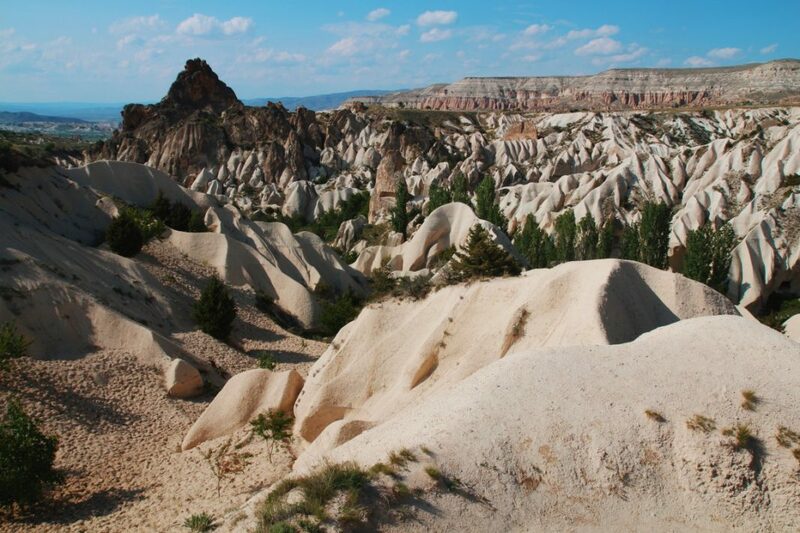 However, in general, it’s recommended to avoid hiking by yourself, especially in Cappadocia. I did hear about some cases of sexual harassment in that area. Also, the general rules for safe solo female travel apply: don’t go out by yourself after 22.00. Stick to women in public transportation. Enjoy amazing hospitality while backpacking in Turkey. During my weeks in Turkey, I only met a few other solo backpackers. Many of them were actually backpacking the Silk Road like me! 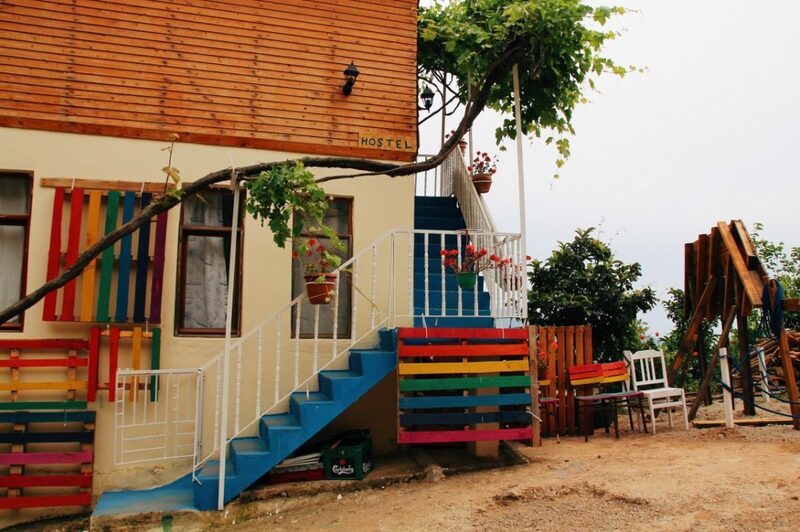 There are only a few typical backpacker hostels in Turkey. In most places, you will stay in a guesthouse. 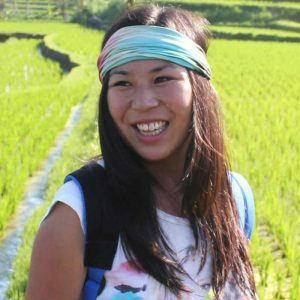 You can meet other solo travelers at your guesthouse or during tours. Most backpackers are found in places like Istanbul, Goreme, Olympos and Ankara. Fire place at Olympos. 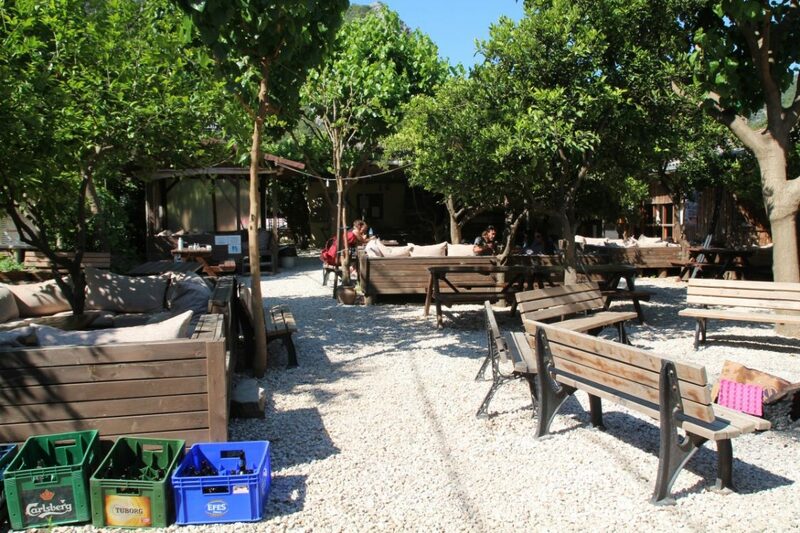 A great place to meet other backpackers! The main language is Turkish, but I found many people also speak English! I usually buy a sim card directly upon arrival. In Turkey, I used Turk Telecom. I had decent 3G almost everywhere. Wifi is also pretty solid. Typical day in Turkey. 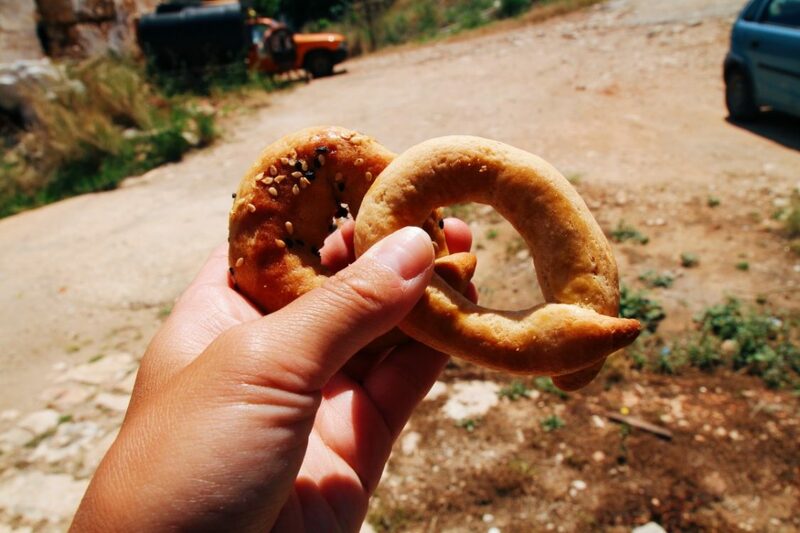 A woman rushes over to me from her house, to offer me some freshly-baked simit! The border crossing from Turkey to Iran was definitely an interesting one. I took a bus around 08.30 in the morning form Dogubayazit to the border. At the border, there was an extensive and thorough check at the ‘Maku industrial zone’. Also, I witnessed a few fights (?!). From the border, I took a bus to Bajarat. Here I exchanged some money. After that, I was lucky enough to meet two Iranian men who offered me a ride all the way to Tabriz. Please note that when I was there (2016), you could not get a Iranian visa on arrival at this border. Please check the latest information online. Always get travel insurance! Personally, I have a year-round Dutch travel insurance for which I only pay a few euro’s per month via my bank. However, during my travels I often take extra travel insurance, which covers specific sports and also travel in regions which are marked as unsafe by my government. For this trip, I used ‘Special Isis by Joho’ (only for Dutch people). Dip in a shiny blue hot spring in white Pamukkale. Board a hot-air balloon and flow over Cappadocia. Behold the Temple of Artemis, one of the Seven Wonders of the World and the Library of Ephusus (beautiful!). 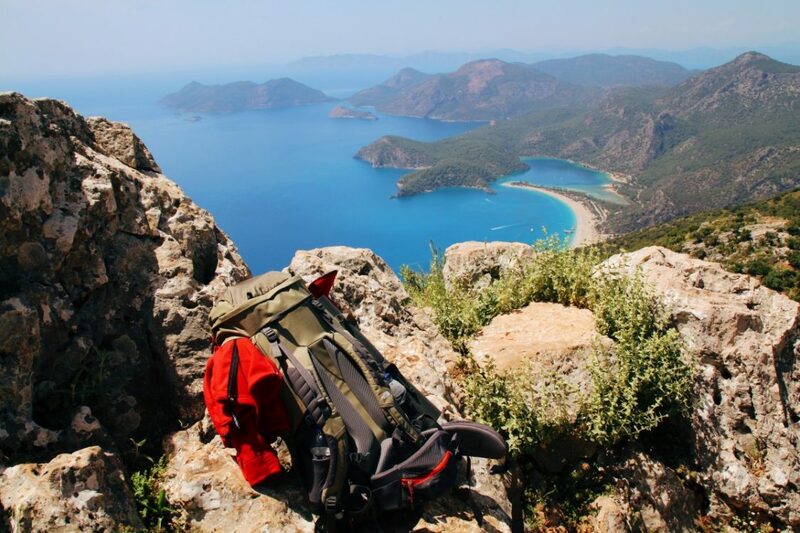 Hike parts of the Lycian Way, one of the most famous hiking routes of Turkey. Chill at pretty, small Limoncino beach near Kas. 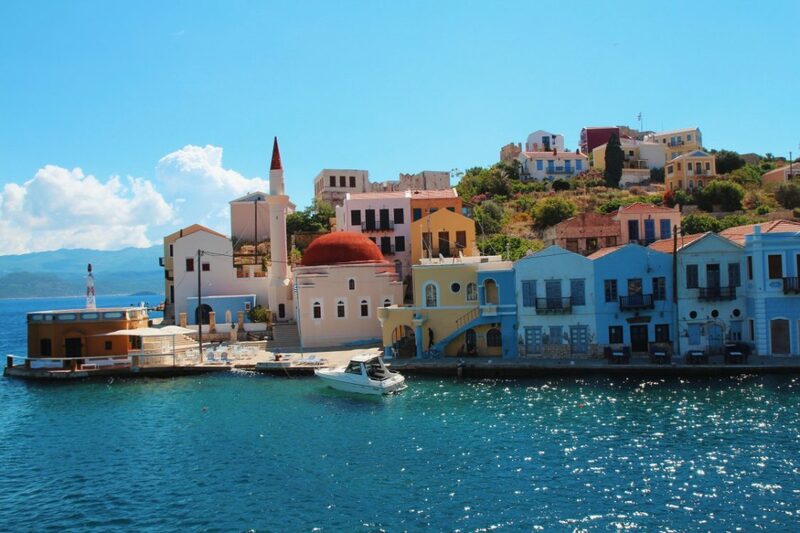 Take a boat to the small, gorgeous Greek island Meis from Kas (a fun day trip). Kayak over the sunken city in Kekova. Sail in Olympos over turquoise water. Enter the Karaka caves and Sumela hanging monastery (from Trabzon). Play Tavla (backgammon) with a cup of chai. 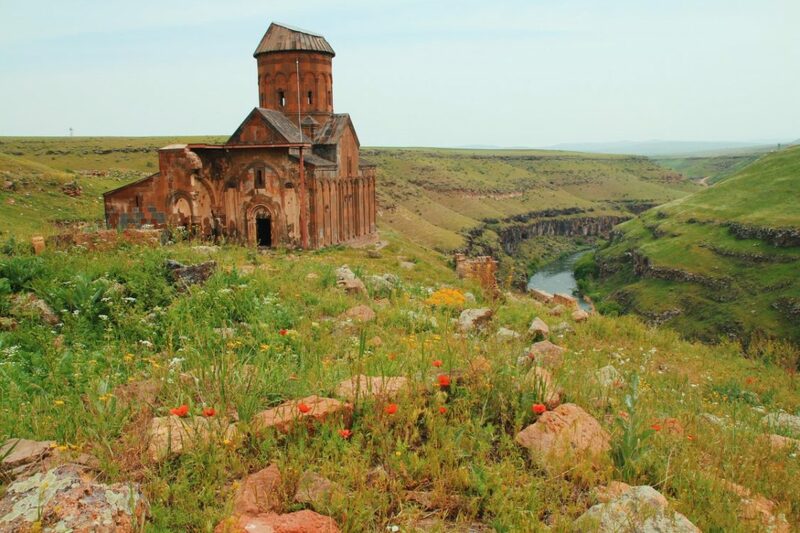 Be amazed by the ancient Armenian capital city of Ani. Camp at the Butterfly Valley. 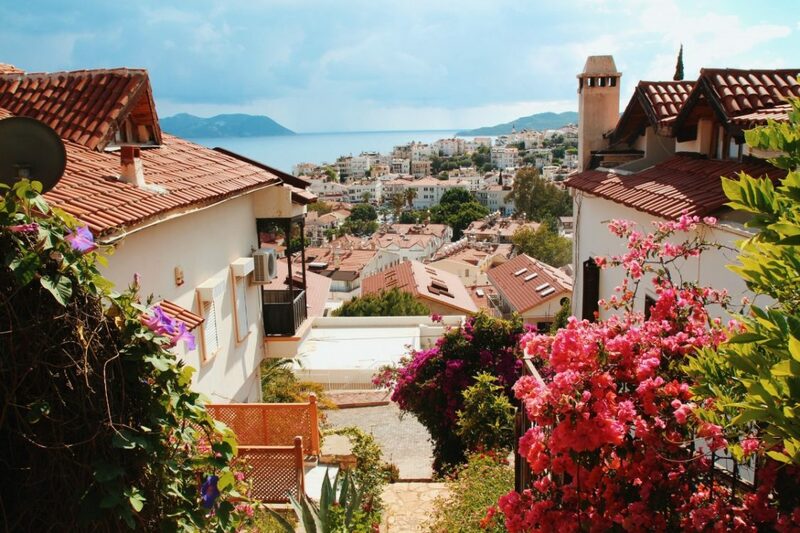 The Greek city of Meis is only a 25-minute ferry ride away from Kas. Let me know if you have any questions about backpacking in Turkey! Yess! Super useful, I will be going later this year and will 100% use this info. Turkey has always been a transit stop! Never got round visiting it and this is pretty comprehensive and useful. Thanks so much! So brave of you going on your own! We have been a little concerned about the safety of this area, but this article may have convinced me to put it back on my list. Thanks so much!